As I sit, exhausted, after a hard day’s work on the Nid, in the garden, digging holes or cutting trees, there’s one thought that keeps me going and gives me the energy to keep up the same pace tomorrow, next week, next month. 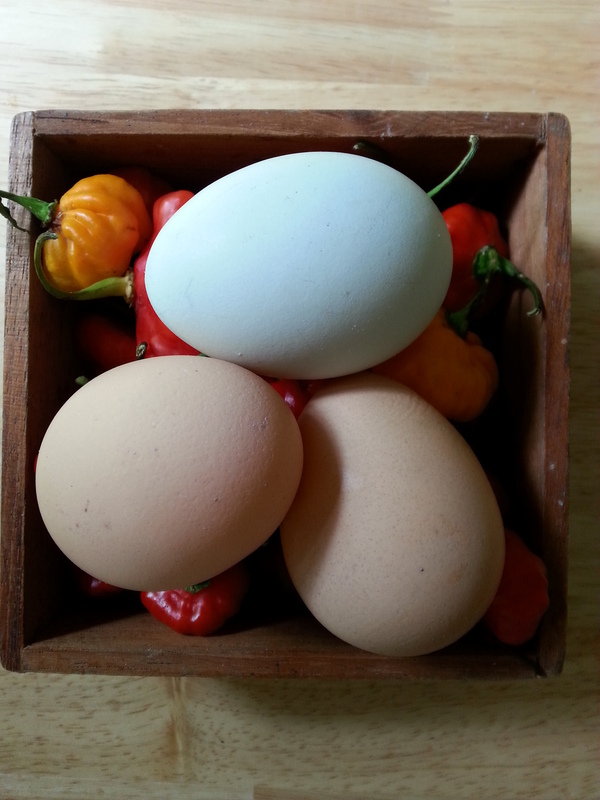 That is, that I’m sitting here eating my own eggs, on my own bread, with my own garden greens and fruit; that soon I’ll be doing all of that, in my own tiny house that I built with my own hands! And how many people can legitimately say that? 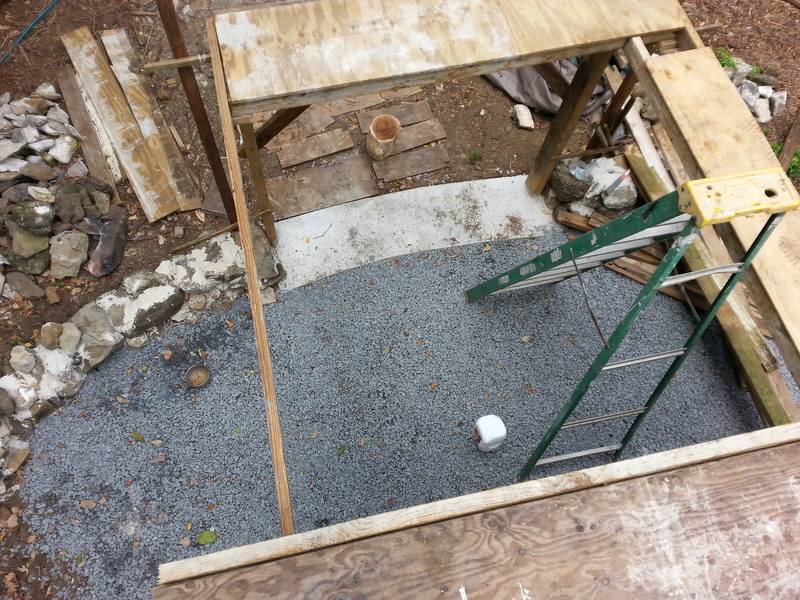 Temporary loft floor and staging over the doorway so that we can reach to work on the rafters and roof. 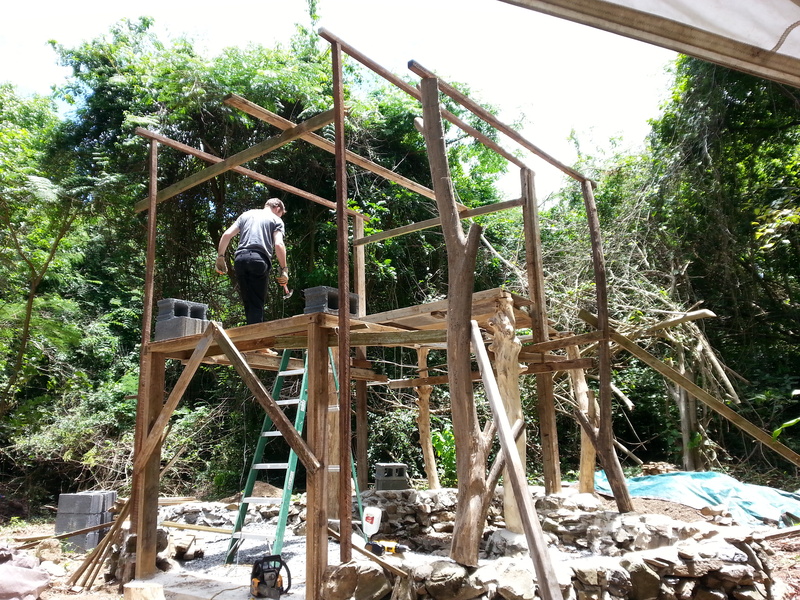 Putting up posts and rafters with Nick, one of our WWOOFers. 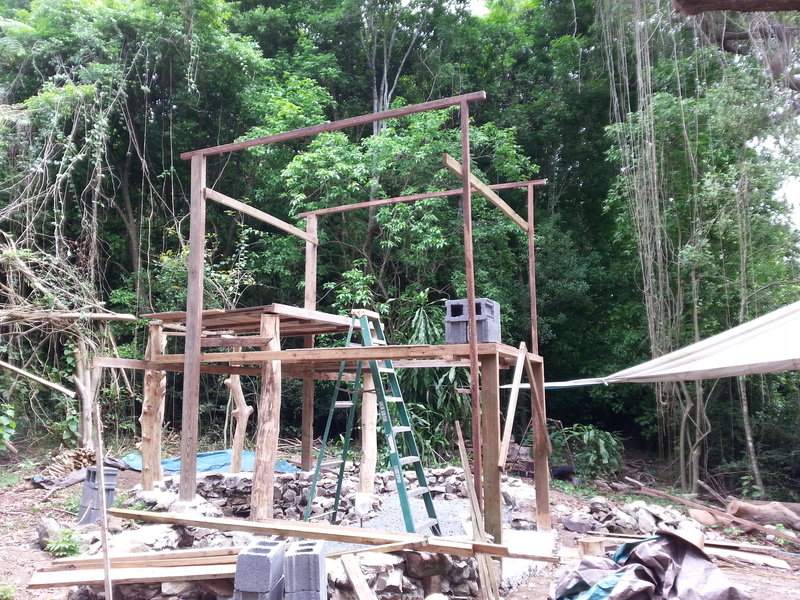 This has been our first week as WWOOF hosts, and so far it has been great! Hopefully our WWOOF volunteers feel the same way. 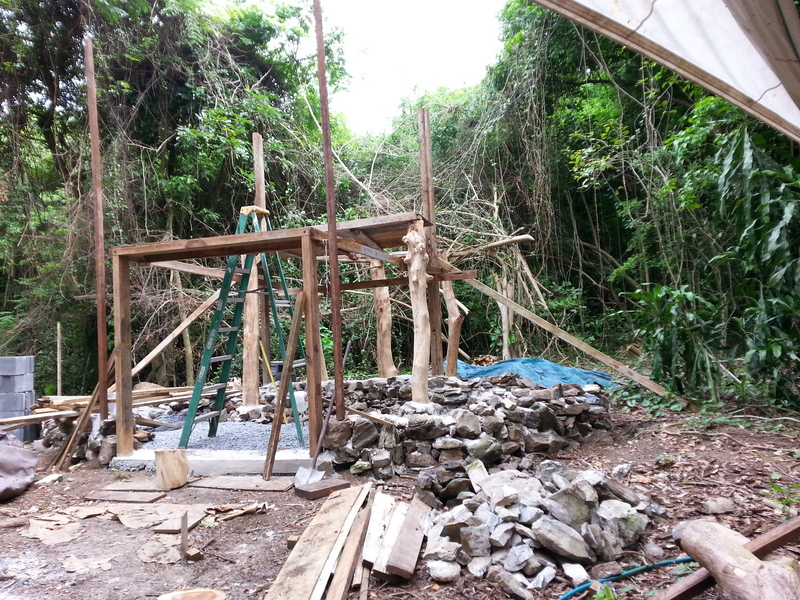 I’ve made great progress with posts and rafters on the Nid with a couple of mornings of help, and there has been much cleaning up of the property and the old ruins; moving rubble, pulling and cutting vines, taking out or trimming unhealthy/unwanted trees, digging out stumps, and removing old sections of fence. 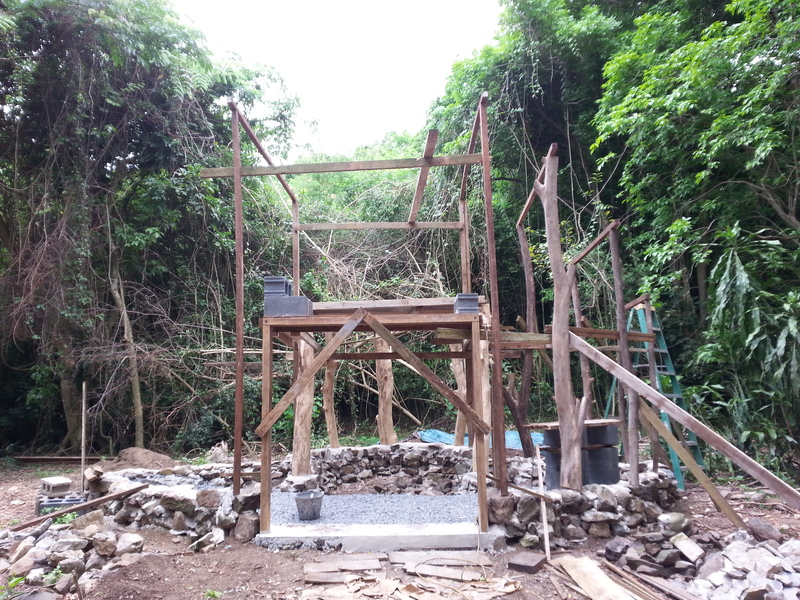 Next up is the building of a trellis, a new gate to make bringing firewood to the oven easier, building a small roof over the oven, and starting to clear for a new vegetable garden near the back of our land. Plus, of course, continued work on the Nid. We certainly aren’t in danger of running out of work. Quick bake day lunch on Wednesday of delicious sourdough pizza. 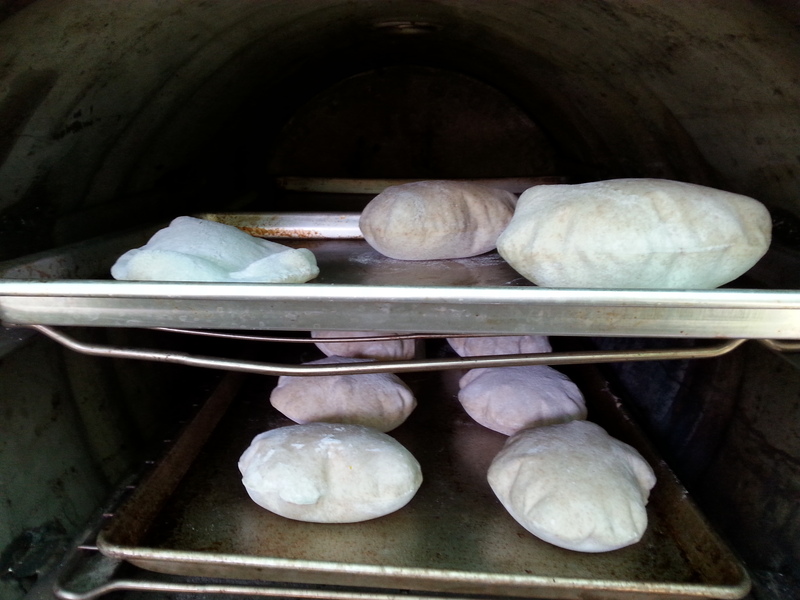 Whole wheat pita in the wood fired oven. 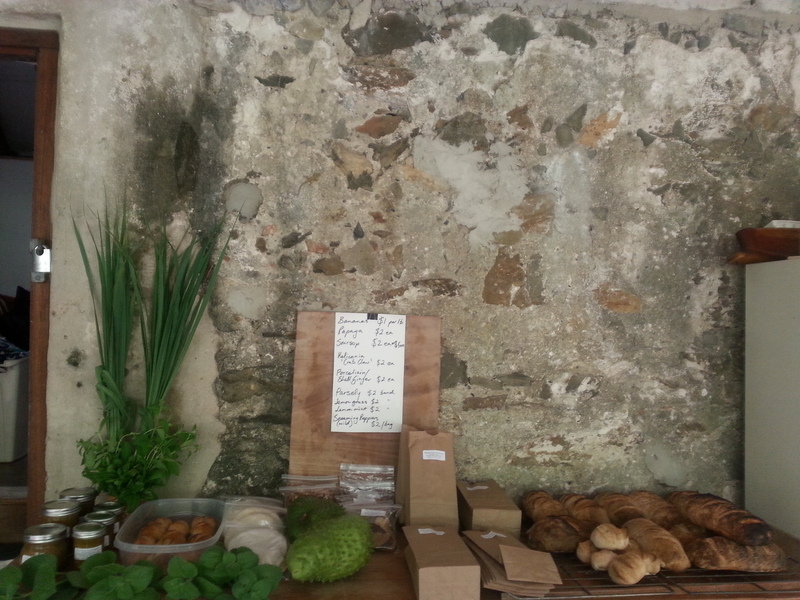 Baking is still going full tilt, now with two bake days per week; Saturdays for private orders through the Products and Produce page here at Nidulari, and Wednesdays through VI Locally Grown. 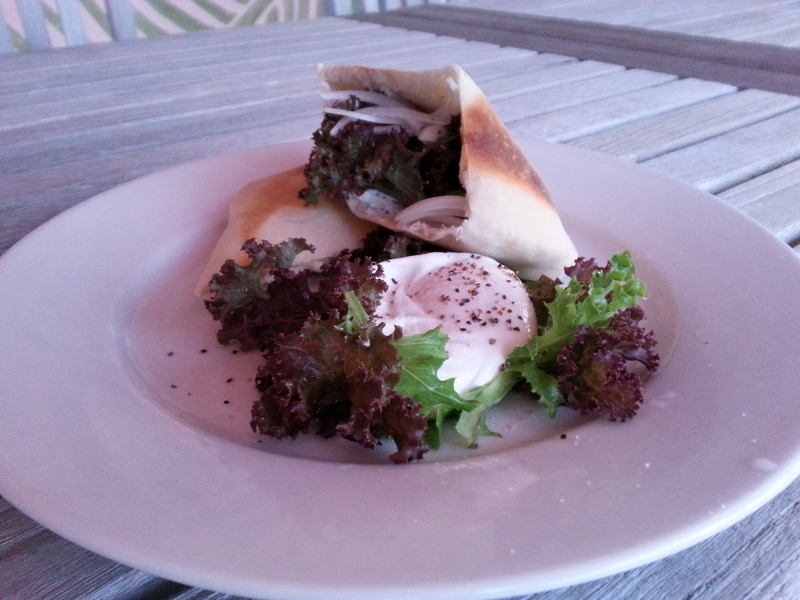 The pita bread went down great this this week, so they will become a regular product in addition to the sourdough! 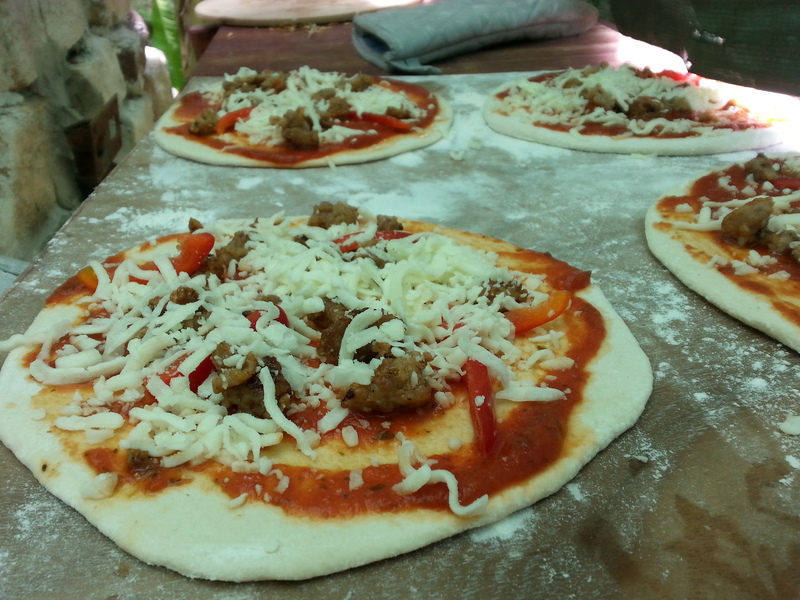 I’m also getting really good at making sourdough pizzas in the brick oven, so perhaps there will be a pizza afternoon sometime. Committing to the second bake day every week so soon is a bit scary, but the first week of it went smoothly, and I hope to keep up the energy and enthusiasm! Mango season has hit us, so soon we’ll be making mango chutney, mango jam, mango pies, you name it! I’ve always had a love/hate relationship with mango season; mangoes are amazing, yet they come in too many for too long, ending up in ankle-deep fruit fly-mango-vinegar mush coating half of our garden. This year my main goal is compost, compost, compost, hopefully thereby avoiding some of the mango mush build-up. Did I mention that I spent all day baking yesterday on some 4 hours of sleep? Well, I’m too old for that, so I’m going to leave you now, take a nap, and then go to the beach to remedy a severe “farmers tan”, and maybe…maybe get to relax for a few hours. Little error. Wednesdays pizza bake is the same photo as Saturdays 18 loaf bake.